"I think of the fans. . . .That�s who I represent here today . . . You! The fans! They are the unsung heroes of our great game� Excerpt from Harry Caray�s 1989 National Baseball Hall of Fame Ford C. Frick Award acceptance speech. But Harry always felt like he worked directly for the fans. He was a fan himself. When he would say, �You can�t beat fun at the old ballpark,� believe me, he meant every word of it! He broadcast games from the bleachers with a cooler full of beer. He tried to catch foul balls with a big fishing net. He wished Happy Birthday on the air to innumerable fans, and signed countless autographs for people. And he loved to lead the fans in the 7th inning stretch singing of �Take Me Out to the ballgame.� Harry probably sold more cases of beer and more tickets to the ball park than any other announcer. Harry Caray entered the broadcasters wing of the Baseball Hall of Fame in 1989, the 13th recipient of the Ford C. Frick Award. Harry was simply one of the greatest baseball announcers ever, ranking way up there on any list with, among others, Vin Scully and Mel Allen. As a broadcaster, he could do it all. He had a distinctive voice, charisma, enthusiasm, style, humor, longevity and consistency. He had that great home run call - �It might be! It could be! IT IS! A home run!� - and the talent to make even a dull game come to life. I had the good fortune to get to know Harry in the mid-1990s when we both worked as Chicago Cubs play-by-play announcers. He was on WGN-TV and I was on WGN Radio. Track #17 of the CD is devoted to �personal memories� I have of Harry, including some times we shared on the air together. He once told me that his two very favorite teams to cover were the 1964 St. Louis Cardinals and the 1984 Chicago Cubs. An entire track spotlights each season, with memorable Harry Caray radio calls of the famous 1984 Ryne-Sandberg-2-homers-off-Bruce-Sutter game, and Harry�s rousing play-by-play work in the 1964 Cardinals World Championship season. If you are a younger fan and your main Harry Caray memory is of him as a venerable Cubs TV announcer, wait until you hear his work with the Cardinals in the 1950s and �60s. He was sensational! I also included lots of funny moments with Harry. Track #9, �Show Business & Fun,� is certain to make you smile and maybe even to laugh out loud! Included also are the stories of Harry�s humble beginnings, his start in broadcasting, and his ascension to Cardinal Radio in 1945. His great call of Stan Musical�s 3,000th hit in 1958 is featured on Track #8. He hooked on with the White Sox in 1971 after spending 1970 with the Oakland Athletics. Chicago and Harry were a match made in heaven, and he spent the final 27 years of his career (and life) in the Windy City. Harry Caray had some great announcing partners in his long career. In St. Louis he teamed up with a pair of Hall of Fame baseball announcers - Jack Buck and Joe Garagiola. His White Sox partner was the colorful Jimmy Piersall and with the Cubs on WGN television, Steve Stone joined Harry for a popular 16-year run. In the mid-�70s, Harry started singing �Take Me Out to the ballgame� at the old Comiskey Park. The story of how this began is covered on Track #12. 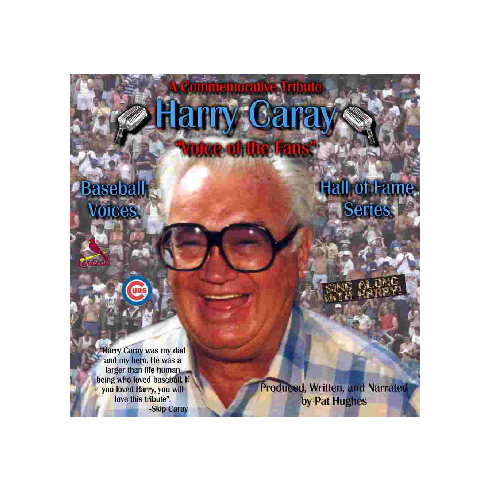 In 1982 Harry was named the �Voice of the Chicago Cubs� on both WGN-TV and Radio. He immediately connected with Cub fans. As big as he had been in the 1950s and �60s on Cardinals Radio, Harry became bigger - gigantic, even - with the Chicago Cubs. In February of 1987, Harry suffered a stroke and missed the first six weeks of the Cubs season. When he returned to work, he was welcomed back by none other than the President of the United States, Ronald Reagan. You will hear the President�s call on Track #14. Harry�s Hall of Fame acceptance speech is the target of Track #16. Harry�s son, Skip Caray, has been the voice of the Atlanta Braves for over 30 years. Chip Caray succeeded his grandfather Harry in 1998 as the Cubs TV voice before joining his dad in Atlanta in 2005. One of my last memories of Harry was at the January 1998 Cubs Convention, just a month before he died. The convention always begins with a media social gathering. As soon as I walked into this big, crowded room, I heard a voice off to my left - instantly recognizable - �Hey, Pat!� Unmistakably, it was Harry Caray; but the way he said it - like an old high-school friend I hadn�t seen in years - �Hey, Pat!� - like he was really happy to see me - I will never forget that moment.! On Valentine�s Day of 1998, Harry took the love of his life, his wife Dutchie, out to dinner in Palm Springs, California. After dinner and dancing, Harry suddenly collapsed. After four days in a coma, Harry Caray died on February 18, 1998, just 11 days shy of his 84th birthday. In the days after his death, just outside Wrigley Field on the Harry Caray tile in the Cubs Walk of Fame, thousands of fans dropped by. They left flowers, candles, oversized black-rimmed glasses, Cubs memorabilia, and . . . beer bottles. In April of 1999 a statue of Harry Caray was dedicated just outside Wrigley Field. He�s been gone for over eight years now, and I still think about him every day. Producing this CD allowed me to remember Harry Caray fondly - all the great highlights and energy and laughter and the love of baseball. I hope listening to it makes you feel the same way.